Hi, I want to take a little time to introduce myself, currently driving an IS-F and a LS460, my wife is pregnant with our 3rd kid, he’s due in December and as the date get closer, the pressure for a more “family friendly” car became greater and greater. A few weeks ago I broke down and my wife and I even test drove the current German Wagon offering, 2011 Mercedes E350 estate and 2011 Audi A6 avant, I didn’t considered the BMW 5 Gran Turismo to be a wagon and the 3 series wagon is way too small; anyway, all these cars are nice but they are a far cry from the fun prescribed by the IS-F. At that point I felt like I was losing handle on the situation, so I half jokingly said to my wife, that I will sell my IS-F for an AMG Wagon. 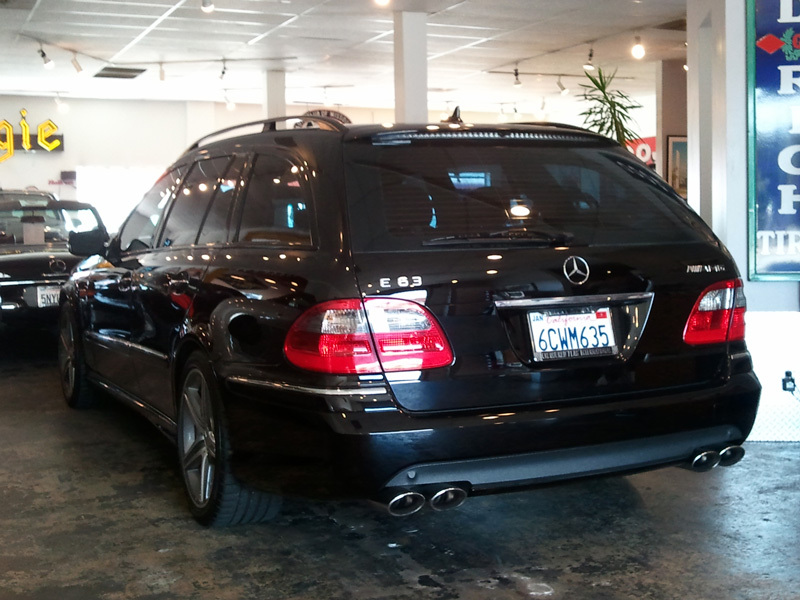 Theses AMG Wagons are not easy to find, they only imported 322 in the US during the 4 years production run, and they were all special order only. As a matter of fact I only saw one on the road once, and I never saw one for sale; that was until Thursday 30, when 2 pop up on eBay motors, one being in LA the other in Wisconsin. After spending some time that night cross checking VIN number, vehicle history, option list and Forums, I decided to take the day off on Friday to go see LA the car, fully aware of the modus operandi for this kind of find: I will be buying the car right there if it is clean. And clean, it is, one of the 62 build for 2008, Black on Black with 15k miles, the car still has the protective plastic stickers on the door sills, trunk sills and in various places in the interior; the wheels do not have a single ding, not one; the paint quality is impressive as I could find any trace of light scratches or swirling. So I put a deposit right there; funny thing is while I was filling up the papers someone called from Canada to buy the car outright sight unseen over the phone, at that point our signatures where on the contract, the car was mine. I will be picking up the car Wednesday, in the meantime here are couple of cell phone pics. I will now burn rubber in a wagon! So hello to everyone, I'm looking forward to spend time on this board, I already have a tons of questions, but I'm using the search first ! Congrats. I've always loved the lines of the wagon. The Ultimate Sleeper in Black...Yay! Hope you talked him down on his price. He needs the sales for sure. Anyway, enjoy and have fun with it. They are pretty rare to find. And welcome to MBWorld. Yes, and I sure pay too much for it, but then again they are hard to find. NASTY in a good way, congrats on a great purchase. congrats...consider yourself one of the lucky ones. p.s. 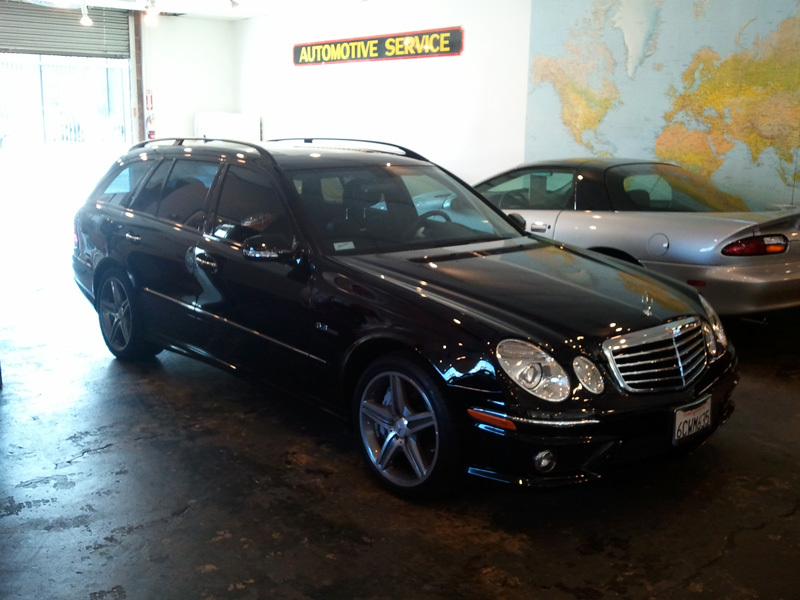 be sure to head to MB dealer asap and get the extended warranty. you never know when MB corporate changes rules of what will qualify in the future for repairs. Congrats on your purchase. With only 62 made that year, it sounds like you really found a needle in a haystack. I'm sure you're just itching to get behind the wheel. Congrats to the OP!! That's indeed a rare vehicle. And I'm with this man, I've never like the E wagon look. The only wagon I'll ever buy is the Audi Allroad. fwiw, only 62 estimated sold in the US. Not 62 ever made. That's what I was thinking, but not what I posted. Doh! Don't listen to the haters. This wagon is beautiful and now you can feel like a man by not driving a lexus. Congrats on the wagon. Thanks for the PM regarding price when I was shopping, too. Congrats on the new purchase!! looks awesome!! Freaking gorgeous! Now if they just had AWD I would be in for the wagon for good. Not a wagon fan, but congrats on the purchase! Wow, this is sick! Congrats on the purchase and welcome to the AMG family. Congrats on the great find and even bigger congrats on picking it up!